Time Travel allows you to capture progress over time by adding multiple 360° pictures to the same location point on a sheet. Whether you capture daily, weekly, or monthly project updates, our patented features allows you to manage your site documentation in one place and keep your stakeholders up to date. 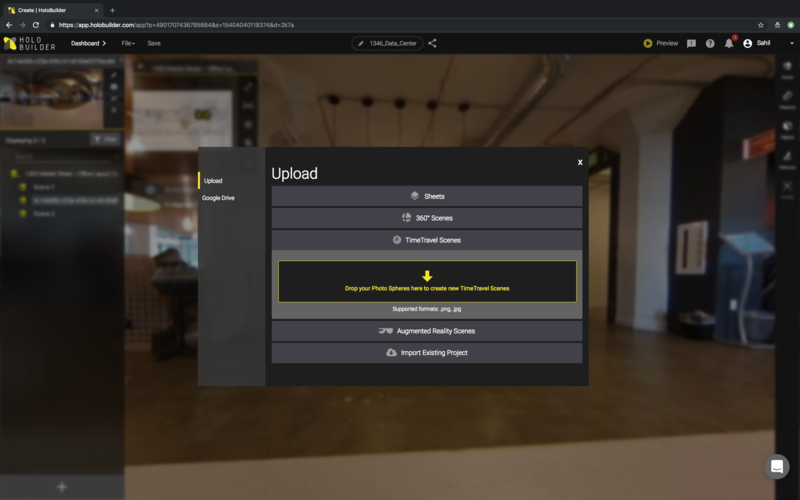 With TimeTravel you are able to organize all your progress documentation in one HoloBuilder project and only ever share one project link with your stakeholders. See an example here. 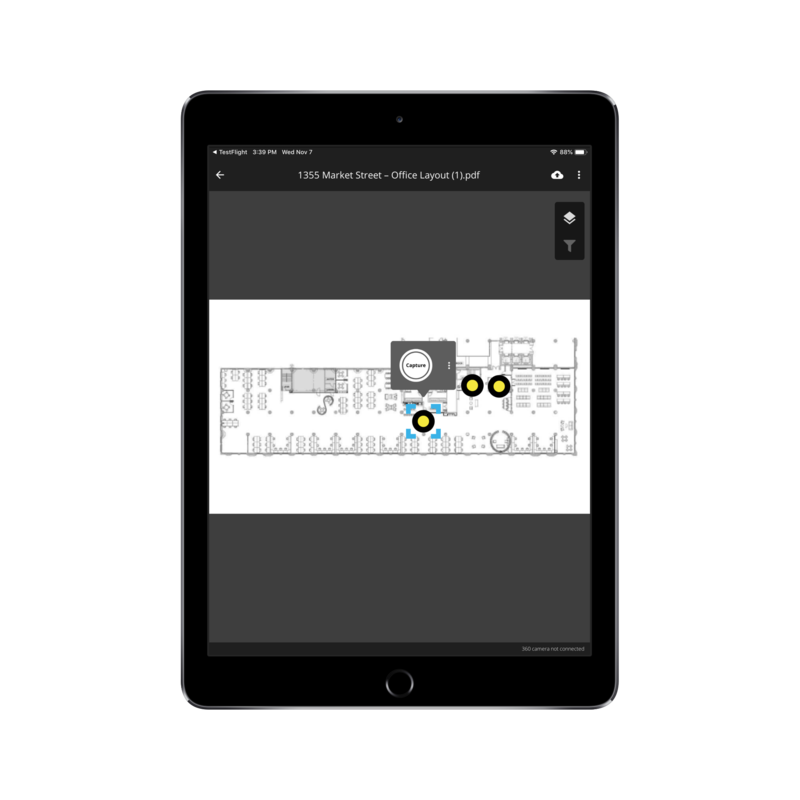 Create your initial virtual tour of the location with the JobWalk app or simply by uploading the captured images manually on your desktop PC. Edit the tour as you are used to. The complete structure of the project will stay the same while adding multiple time travels to each scene. However, any objects or actions that you added to your initial scene will not be automatically transferred to the Time Travel scenes of that scene and need to be added separately for each time travel. 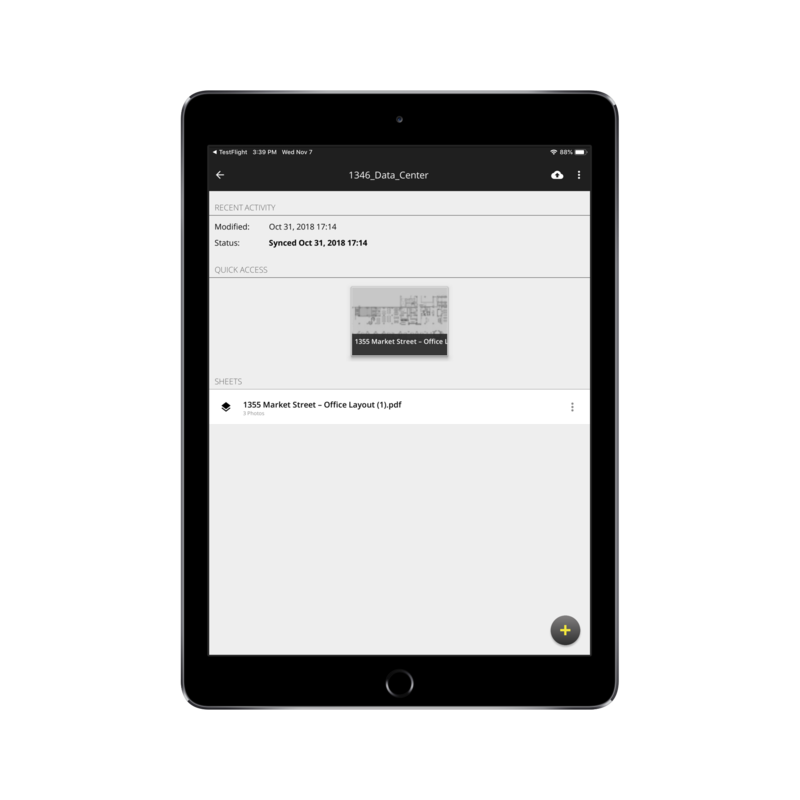 Add time travel scenes either directly on site with the JobWalk app or upload them on your desktop PC to directly edit them. Use and add time travels directly in the JobWalk app to an existing project. A general introduction to the JobWalk app can be found here. To add time travels in the JobWalk app, go to the overview of a project. Open a sheet and tap on the waypoint you wish to capture. Simply tap the "Capture" button and a TimeTravel scene will be saved. Place your tripod with the camera on the exact location where the first image was taken in the room. Then, tab the waypoint marking the room you are currently on the sheet to trigger the image capturing. Wait until the capturing is processed and proceed to the next room. In contrast to the web application, there is only the possibility to add one time travel scene after another. It is possible to add new time travels by clicking on the plus button at the bottom of the project panel on the left-hand side of the editor. A popup opens for adding new scenes, sheets and time travels. Select the tab ‘Time Travel Scenes’ to add a time travel to one or more scenes of the tour, so-called hotspots. Note that it is only possible to add one time travel to a hotspot at a time. However, you do not have to add a time travel for each of the hotspots in your project. Upload the desired time travels for the project either by dragging and dropping one or more images onto the highlighted area. Alternatively, you can browse the corresponding images by clicking on the highlighted area. Same as with the dragging and dropping, you can select one or more images to be added at once from the browsing window. To get additional help on how to add a time travel, watch a short tutorial video by clicking the blue button in the lower right corner of the highlighted area. Select the sheet to add the new Time Travel scenes to. Select the ‘MERGE ALL’ button at the top of the merge view to directly merge each Time Travel scene with its opponent. The scenes will be matched horizontally with the corresponding hotspot. If there are more hotspots than new scenes then only the hotspots opposite to a new scene will be merged with the corresponding scene. This option is very practical and fast, however, you need to make sure that the new Time Travel scenes are in the same order as the initial hotspots before merging all. You can rearrange the Time Travel scenes in the merge view by drag and drop. You can always merge one pair at a time by clicking the arrow between the two images at the top. Either directly merge the top two scenes or rearrange before merging the top two scenes before merging. If the Time Travel scenes are not in the right order and cannot be merged directly with their opponent, simply click and hold the according Time Travel scene in the column of ‘New Scenes’. Drag the selected scene onto the corresponding hotspot scene in the left column (see image below). Release the dragged scene to merge it with the hotspot scene. Note that you can only merge one ‘new scene’ to one hotspot scene. Any extra scene in any of the two columns will simply stay unmerged. Any merged scenes will be moved below the ‘MERGED‘ line. Please note that you can only merge one ‘new scene’ to a hotspot scene in one step. Merged scenes will be moved from the merging area. To undo a merge during the merging process, simply click on the scene with the arrow on it in the ‘New Scenes’ column (see image below). Both, the hotspot scene as well as the new scene, will return to the merging area, available to be re-merged. Complete the merging process by clicking the ‘DONE’ button and return to the editor. If you want to re-assign a TimeTravel scene click here to learn more. Add any objects, actions or animations to any scene as you are used to. Both, the hotspot scene as well as the time travel scene can be enriched as usual. Keep in mind, that you need to edit each time travel iteration individually. Your inserted object, actions or animations will not be applied to each iteration automatically. You can set the orientation of a scene for each scene individually. Select the hotspot scene or any of its time travel scenes and click on the Scene button in the sidebar. You can rotate the scene in any orientation you like. To set a default view for any scene, select the right scene, rotate the scene to the desired view and click on the little camera symbol next to the scene’s preview in the scene panel on the left. Keep in mind, that you need to edit each time travel iteration individually. Your default view of a scene will not be applied to each iteration of the scene automatically. Drag and drop the scenes in the project panel to rearrange, e.g. within a sheet. To reorder the time travels listed in the time travel drop-down menu, you need to adjust the timestamp in the scene properties of the time travel scene you want to rearrange. Save the new time stamp. If the drop-down does not refresh immediately, switch to another scene and back. Change the 360° image of a time travel scene by selecting it and clicking the two facing arrows next to the scene preview. 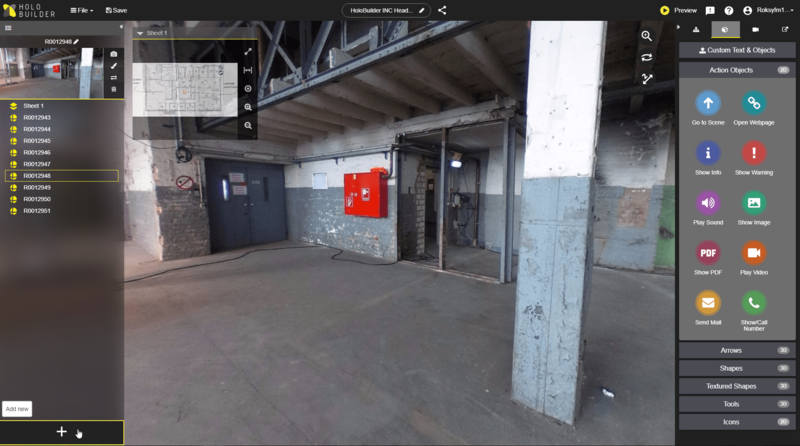 Browse for the new 360° image on your local drive and apply it. All added action object etc. will stay the same. View the Time Travel project in your browser on the desktop or a mobile device. The Time Travel scenes will be accessible with the drop-down menu in the upper left corner – below the sheet integration if added. Click the drop-down menu to open the available Time Travels. Select the state of the scene you want to view by clicking on the corresponding timestamp entry. You can switch between the different states of a scene by repeating this process. Change to another scene and access the Time Travels of this location. Share the projects as any other project with your colleagues or associates to easily discuss any documented changes and developments. If you still have any questions about Time Travel or HoloBuilder in general, please let us know by e-mail at support@holobuilder.com.